The mission of the Daleville Department of Public Safety E911 Dispatch Center is to serve the citizens and visitors of our community by answering emergency calls for service and dispatching the appropriate police, fire or rescue services, 24 hours a day/ 7 days a week when needed. It is our goal to handle all such requests in a courteous, professional, expeditious manner in order to reduce/ minimize as much as possible the injury, loss, and/ or trauma associated with that specific incident. Be prepared to provide the following: What is happening - location - what is your name, address, and telephone number. DO NOT HANG UP UNTIL THE DISPATCHER ADVISES YOU TO DO SO. It is improtant to have your house numbers visible from the street. This will assist emergency responders in locating you as quickly as possible. 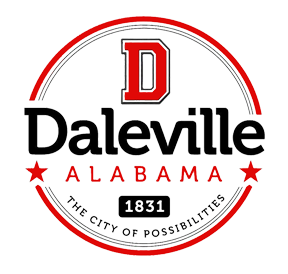 The City of Daleville has an ordinance the addressing of house and property will make the identification easier for emergency responders. Chapter 10, Article II, Building Addresses and Numbering, Sec. 10-31 states the following: "all addressing shall be a minimum of 3 inches in height, durable and weather resistant and recommended that all numerals and characters shall be affixed to an 18"x6" mounting pad covered with a green retro reflective material and all numerals and characters shall be maintained in a legible condition and shall be clearly visible for the traveled portion of the addressed street. This should significantly reduce the response time of all resources." The complete Code of Ordinances may be viewed under the GOVERNMENT tab of this website. The Daleville Volunteer Rescue Squad will make address signs for a cost of $20.00. All proceeds benefit the Daleville Volunteer Rescue Squad. REMEMBER: The 911 dispatcher will not provide non-emergency assistance over the 911 system, but will refer the caller to one of the non-emergency phone numbers. Non-emergency calls to E-911 can be dangerous. If a dispatcher is answering a non-emergency call on the E-911 line, someone with a real emergency might be delayed getting the immediate help they need.